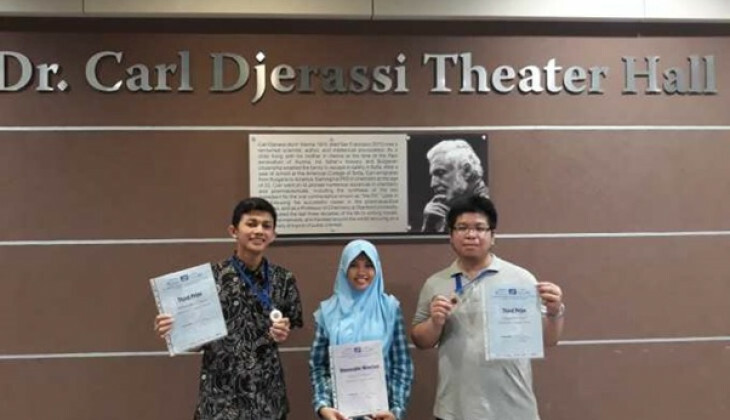 Three students of Universitas Gadjah Mada have won more awards in the International Mathematics Competition (IMC) 2018 held from July 22 to 28 in Blagoevgrad, Bulgaria. They successfully took home two bronze medals and one honorable mention award from the world competition. Alzimna Badril Uman and Adryan Wiradinata are the silver medalists, while Resita Sri Wahyuni is the recipient of honorable mention award. The three students were selected to represent Indonesia in IMC 2018 along with six students from other Indonesian universities. This year’s IMC was joined by 351 participants from all around the world. In this prestigious competition, students from various world universities were challenged to solve various problems in algebra, analysis (real and complex), geometry, and combinatorics. Alzimna said this is his first time competing in IMC and is proud for bringing home medals from this world competition. “I am proud of winning the third place and taking the name of UGM and Indonesia to the international level,” he said on Friday (8/10). The success of these three UGM students is the result of their efforts and hard work in preparing for the competition. In addition, they were also supported by their lecturers and alumni of IMC UGM who have scored achievements in previous competitions, as well as intensive guidance from the Ministry of Research and Technology. “Hopefully, Indonesia can be more successful in the upcoming competitions,” he concluded.